Gerald (G.B.) Moore was a fifty-year plus member of ALPCA, a very select group unto itself. G.B. personified the unselfish collector who willingly gave his time and knowledge to help new collector's discover the wonders of license plate collecting. He lived in the same home in Kansas City, Missouri for over fifty years, which is as Mid-American as one can be. He was a driving force in the Heartland region for decades hosting numerous local meets and promoting ALPCA to one and all. His collection was universal and primarily housed in a special building behind his house. G.B. joined ALPCA in 1955 at the age of 42. At 93 he sponsored a Heartland regional meet that turned into a celebration of his fifty years in ALPCA. G.B. passed in December 2006. Former club President, Jim Fox spoke of G.B. this way. "He was a true gentleman, and generous with his plates too." "I know we made trades from the git-go, and in those days (1971), I wouldn't have known a fair trade from a foul one." "But this man swapped with me a lot and really helped me to get into the swing of collecting. He was a very unassuming man-just a nice guy in a country sort of way." Long time member, Tom Allen, wrote how it was G.B. who introduced him to ALPCA at the age of ten (1973) when he was first inflicted with plate disease. And this spirit continues today. Member, Larry Niederschulte has been collecting plates for only two years but he too thanks G.B. for introducing him to the wonderful world of ALPCA and encouraging him in the hobby. Member, J.D. Adams wrote that the first thing collectors would ask upon arriving at a meet was "You seen G.B. yet?" J.D. goes on to speak of his first meeting with G.B. and how G.B. told him that he was a real collector in that he wasn't looking at the value of the plates but was in fact doing it for the enjoyment. Stephen Raiche echoed those comments and credits G. B. with much of his enthusiasm for the hobby. If that is not best evidence of a Hall of Famer I don't know what is. For over fifty years G.B. 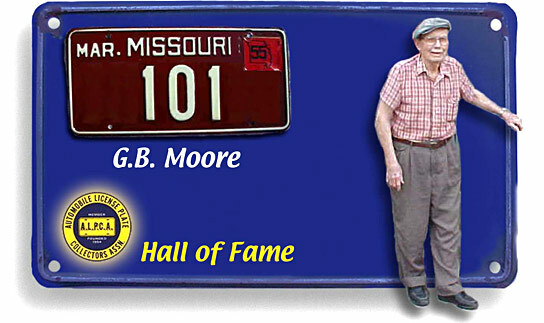 Moore recruited new members, promoted the hobby and shared his knowledge and collection freely and openly. It is this spirit and dedication that ALPCA needs more of. He did not hold national office but he inspired most of those who have. The reviews of your peers are the measure of your contribution. For fifty plus years of the true spirit of ALPCA the membership welcomes Gerald B. (G.B.) Moore to the Hall of Fame.